Iran: Is Regime Returning Lawyer Nasrin Sotoudeh to Prison? The Iranian regime is threatening to return prominent human rights lawyer Nasrin Sotoudeh to prison, six months after she was released. 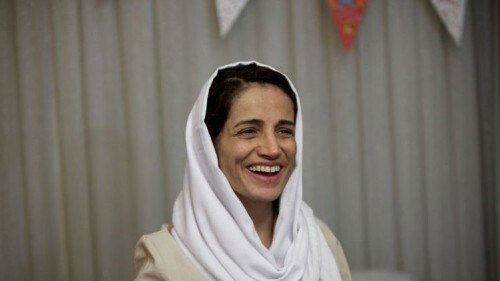 Sotoudeh was arrested in September 2010 for her legal activities and speaking to the media, charged with “actions against national security” and “propaganda against the regime”. She was sentenced in January 2011 to 11 years in prison and a 20-year ban from the practice of law. The sentence was later reduced on appeal to six years, with a 10-year ban. On Sunday, the Intelligence Ministry summoned Sotoudeh for questioning over an undated video, posted two days earlier on YouTube, in which Sotoudeh is enthusiastically received by an audience as she appears at a literary gathering. We are in Khuzestan Province (in southwest Iran) with the kids for a two-day trip. Moments ago, while shopping in the Dezful bazaar, they contacted us from the Intelligence Ministry and summoned Nasrin and our host for no reason and in an illegal and rude manner. The Intelligence Ministry official told us to appear for questioning in an hour. Art is the best path to get around despotism. Art changes the rules of the game. It can make fun of the serious words of despotism. It can respond to the power of despotism with satire and change the rules this way. Sotoudeh also spoke about political prisoners and the three-year house arrests of Mir Hossein Mousavi and Mehdi Karroubi — both candidates in the disputed 2009 Presidential election — and Mousavi’s wife, activist Zahra Rahnavard. I have been free during the recent months. (But) we appear to be free but our hearts are always caught between two groups: those who are imprisoned in their own homes, Mrs. Rahnavard, Mr. Mousavi, and Mr. Karroubi, who are prisoners of conscience, and also prisoners of conscience who are in the prisons of other Iranian cities. They include not only political activists but many civil or ethnic and religious minority activists. Today I wear a shawl among you that was knitted for me by a fellow-prisoner from a minority religious group. I wear it remembering them and I thought I would wear it to your gathering…. We must remember about the prosecution of prisoners of conscience that were carried out without regard for the law, in secret courtrooms, or through security mechanisms. The house arrest of these three is also an example of arbitrary detentions. NextUkraine Audio Analysis: What’s NATO Got to Do With It?